Hey, it's Saturday everyone! I am saying that just in case you do not know your days of the week but that is highly unlikely unless you didn't graduate kindergarten. If you really didn't graduate kindergarten, I am sorry. I was just kidding and not trying to make fun of you in any way at all. 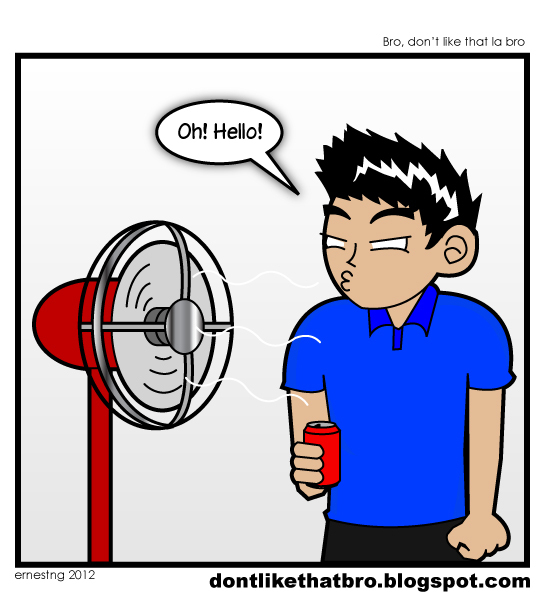 As I have been doing this comic series for quite awhile now, it seems that even the bros have their own set of fans. Every once in awhile, a random nice stranger will come say hi to them and how they can recognise how the bros look like in real life is utterly beyond me. Nevertheless, today we shall look at how Jon reacts when he meets a fan. He is very professional in it. So if you do know how Jon looks like in real life and you really wanna go say hi to him, just be careful. He might just troll you. But trust me you guys will have a good laugh after that. He is super awesome and friendly. Unless you are a sensitive prick who can't take a joke. Finally meeting a real life fan. Ahahaha. that is so cute. Haha, after such a frustrating night over DLCW match, its good to come here for some laughter to cool off the night before sleep.